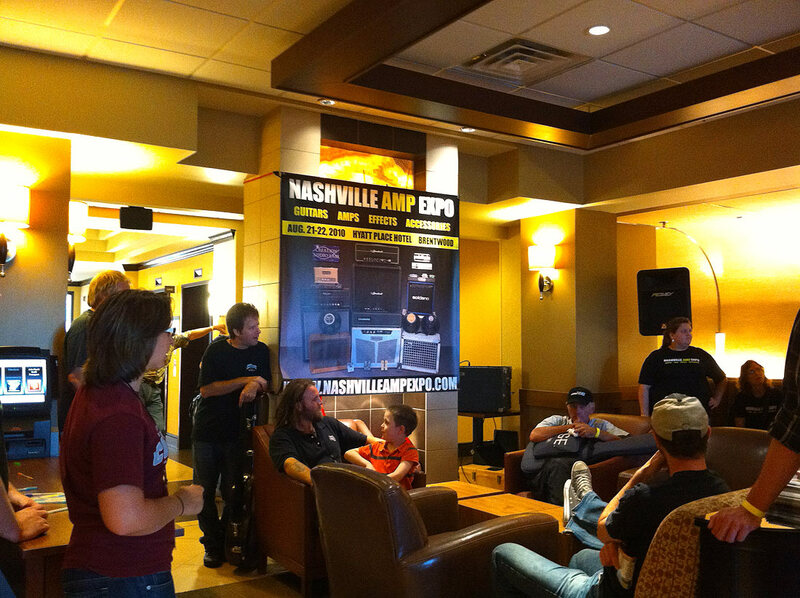 The 2010 Nashville Amp Expo was an incredible experience this year. So many wonderful products and awesome builders. Unfortunately, two days doesn't give one nearly enough time to experience everything, so I had to carefully choose which rooms I dove into. Also, this year I felt it would be better if I were to elaborate a little more on each of the vendors and individuals I spent quality time with. The above sub-menu links to full blog posts based on my experiences with each of these fine builders and players. 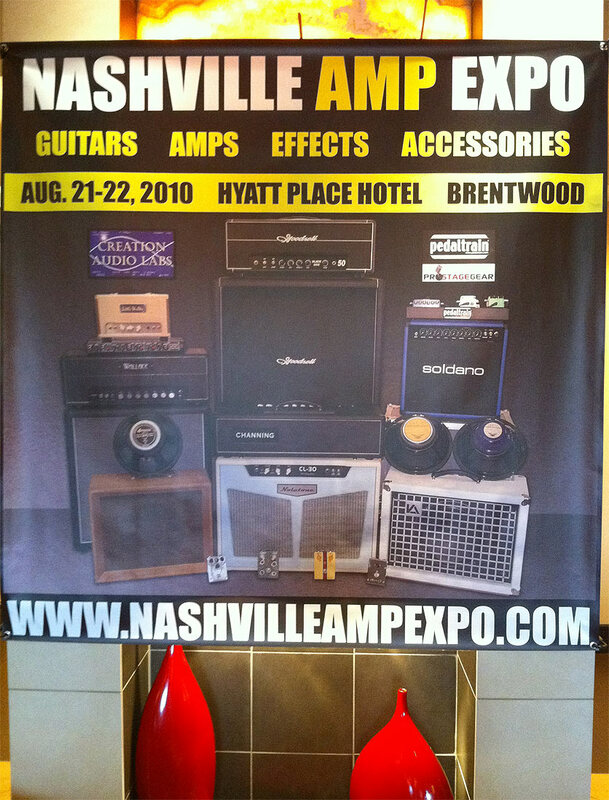 W hen I looked at the calendar earlier this month and saw that the 2010 Nashville Amp Expo was just around the corner, I could not believe it. It seems like my wife and I were just there for the 2009 show a few months ago, not a year! These shows are so much fun and so inspiring that the experience stays with you long after the show ends. This year Creation Audio Labs did a smart thing by grouping all the guitar builders, pedal and effects guys and other "non-amp" products on the same floor. The amp and cabinet vendors, conversely, were located on the other floors (there are five total floors in the hotel, and all of them were full!). This made demo'ing guitars and pedals much more enjoyable than last year. It's a bit difficult to hear the nuance of a beautifully hand-crafted acoustic guitar with a full-stack Marshall clone blasting on "11" across the hallway. It was a great idea to separate the two and it shows how the Expo is maturing and improving each year. 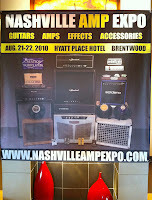 Among the great vendors at the show were Mesa Boogie, Shaw Amps, Delgado Guitars, George L's cables, Ark Amps, VVT, Hipkitty, Satellite Amps, Peavey, Egnater Amps and Larrivee guitars. I just love getting to meet a lot of the people behind the brands and products that I use and read about online and in magazines. It truly is a treat. As usual everyone was gracious and inviting. Even my wife, who is not a player, always leaves these shows filled with excitement, inspiration and a passion to create something. Being surrounded by all that talent and creativity does something positive to you. It's really hard to describe, but I can say if you've never been to one of these you must make it a priority to come out and enjoy next year's Expo. You wont' regret it! I was so pleased to finally get to meet Andy Fuchs of Fuchs Audio Technology. I am a proud owner of a Fuchs ODS 30 head that I acquired nearly two years ago from a fellow Gear Page enthusiast, and I have been wanting to meet Andy ever since to tell him how much I love the amp and my tone... so I was thrilled that I finally got my chance! Fuchs Audio Technology designs and builds some of the most wonderful guitar amplifiers and pedal effects on the market, in addition to making modifications to Fender amps, Music Man amps and older model Traynors (check out the Service & Mod Page on the Fuchs Audio website for more info on existing amp mods). Andy has over twenty-five years of experience as a musician and tech, so you know that when he creates a piece of gear it is really going to be something special. As a side note... if you have never played one of Andy's amps, I highly recommend that you do. Experiencing an Overdrive Supreme, for example, could very well end your tone chase... for life! I absolutely love my ODS 30. The liquid sustain of the overdrive and the beautiful harmonics and overtones that jump out and envelope each note, coupled with an incredible decay "bloom", is something that has to be experienced. And the cleans are equally as good! The amp is capable of nice bright, punchy (and LOUD) cleans or lovely "round", soft and warm jazz tones... they are all there. This is one versatile amp. There is simply too much to write about the ODS 30 to sum it all up in a paragraph, so look for a long overdue review of this amp very soon. My wife, Claudia, and I really enjoyed hanging out with Andy and his gracious ...and beautiful... wife Annette. The stories about Andy being such a down-to-earth and nice guy are all absolutely true. I had a lot of questions regarding his amps and pedals and he was kind enough to answer and explain everything that I wanted to know. 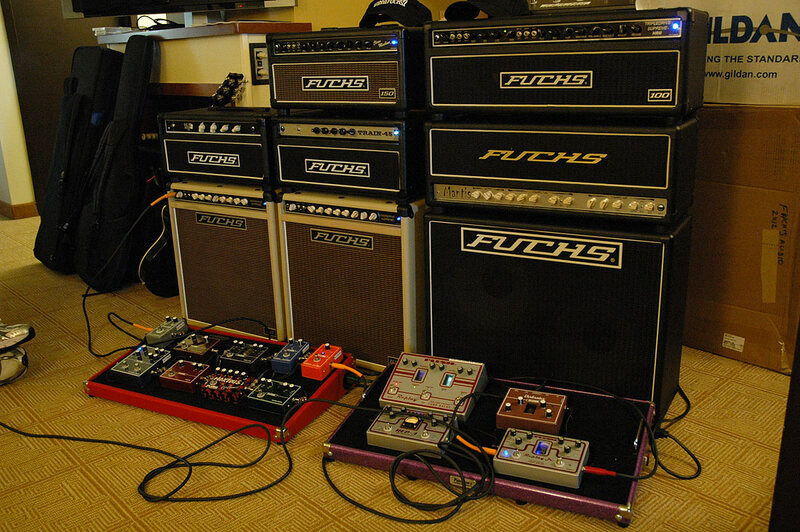 On the floor, right in front of a wall of Fuchs amps, were two pedal boards full of the Fuchs Plush FX pedal line. Andy promptly plugged me in and took me on tour of each pedal. What a treat! I had always heard good things about Andy's pedals, but I was truly blown away by the tone, quality and sheer number of effects he has in the line. Some of my favs were the Royal Plush compressor, Extreme Cream OD, Noxious distortion, Verbrator and Replay Tube Delay. I have been needing a good compressor for some time now, but never found one quiet enough for my taste. After hearing how dead silent the Royal Plush compressor pedal is (and how great it works), I was sold and bought one on the spot. The pedal is shipping to me as I write this, so stay tuned for a full review of the Royal Plush after I've put it through its paces with my rig. 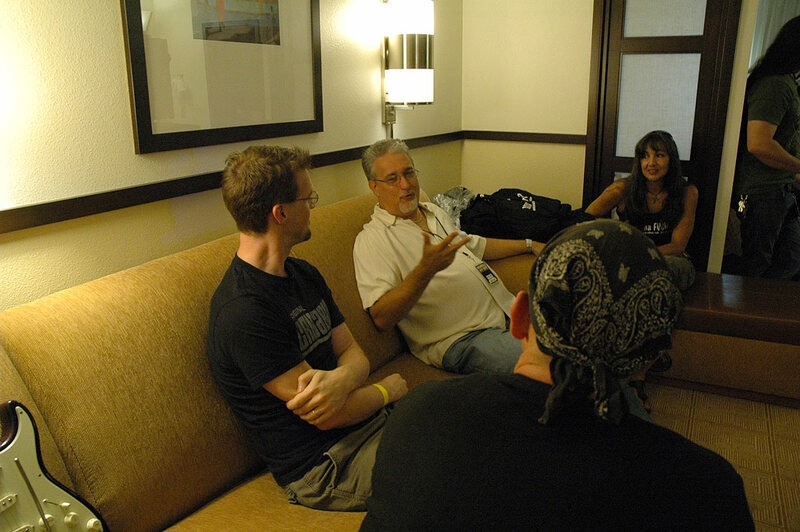 Hanging out with Andy and his wife was truly one of the highlights of the Expo for me. I thank them both for their hospitality and, especially, for all the great products they make that inspire us all. While at the Expo I got to meet, jam with and get a lesson from Robbie Calvo, who is hands down one of the best guitar players I have ever heard. A graduate of the famous G.I.T. (Guitar Institute of Technology) located in Los Angeles, CA; Robbie went on to teach guitar at England's London Musicians Institute. Robbie has won various guitar competition awards over the years and has even contributed guitar technique articles for Guitarist Magazine. He is currently a sought-after session player and hired gun on the Nashville music scene when not writing and pitching songs by day, and burning up local Nashville clubs with live performances by night. As these impressive credentials suggest, Robbie Calvo is a remarkable player and, as I soon discovered, an equally remarkable teacher. I don't often get the chance to meet such an outgoing, well-rounded, humble and multi-talented person as Robbie. From the get go he saw that I had some burning questions about music theory and he literally jumped at the chance to share his knowledge with me. We spent practically an hour together going over some of the various points of his excellent "Sweet Notes" instruction method. Robbie has somehow found a way to take the complexity and confusion out of chord and scale theory and boils it down to the real essence of good playing... the sweet notes. I was so impressed with the method that I purchased the DVD. Look for a full review here soon once I have the chance dig deep into it. Apart from being a great player, it doesn't take long too discover that Robbie is also a great human being. Easily one of the nicest guys I have ever met. I was truly inspired and I look forward to learning as much as I can from his Sweet Notes DVD. As a side note, Robbie is also actively teaching guitar and is currently scheduling lessons. If you live anywhere near the Nashville area, or are planning to visit the city, I highly recommend contacting Robbie to schedule a lesson. You won't regret it and you'll definitely leave him a better player! I can't wait to go back to Nashville to get another lesson. I told myself I would not be purchasing any big-ticket items at this year's Amp Expo. It simply was not in the budget, and that was that. 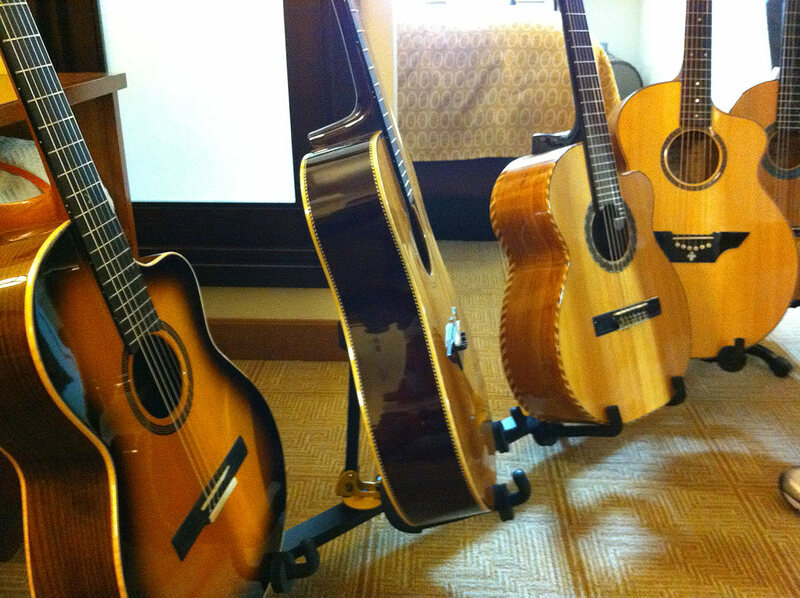 After meeting Jim Soloway and playing his guitars for the first time, boy did that resolution go flying out the window! 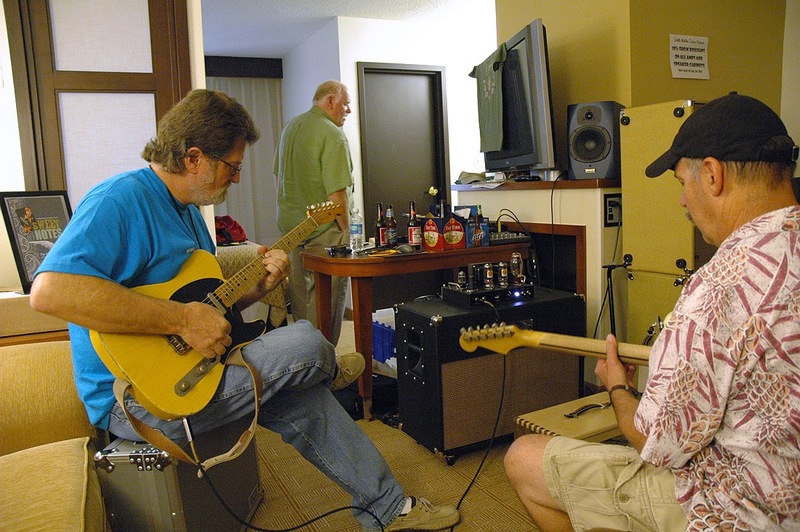 Jim's room was my first stop at the Expo and we easily spent a couple of hours demo'ing guitars, talking gear and finding out which of the Soloways that Jim brought with him to the show was my favorite pick... or did it pick me? Jim is one of those intense, passionate, super patient and genuinely nice guys that you just love to meet and hang out with. It was a real pleasure to hear Jim tell his story, explain his philosophy on luthery and to just hear him play. And, man can this guy play! 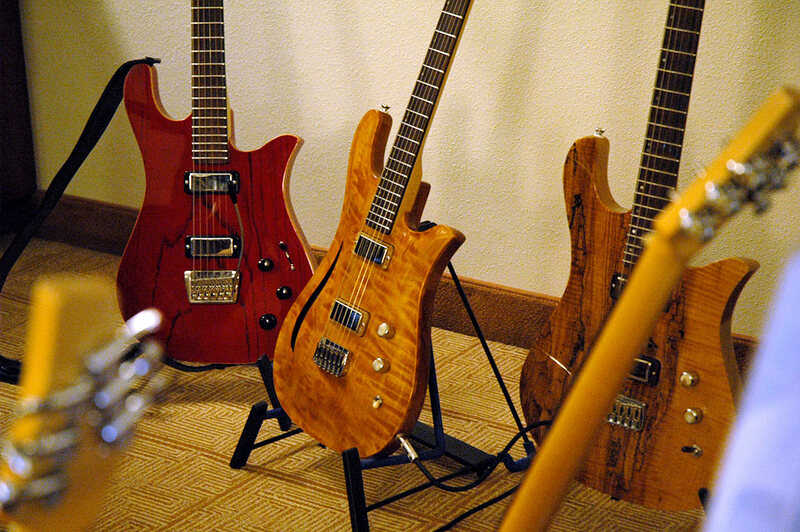 Jim inadvertently started Soloway Guitars about eight years ago while in search of his idea of the perfect guitar. Primarily a 7 string Jazz player, Jim was never quite satisfied with the often muddy low-end of the 7 string and wanted to build a guitar that had those "piano-like tones" he had been in search of his whole adult life. On his kitchen table one day, Jim drew and cut out a shape from construction paper (-- see photo left --) that would eventually become a series of three prototype guitars... all of which were 7 string designs. From there Jim and crew set about applying everything they had done and learned to a 6 string model and the current production Soloway Swan was born. All Swans have a 27" neck scale, which is often used on baritone guitars that are tuned from a perfect fifth to an octave lower than standard tuning. The Swan, however, is tuned to standard A440 pitch. For many years the 27" scale, 6 string Swan was the only Soloway model offered. Jim recently announced a new direction at Soloway Guitars with the introduction of the 25.5" scale Gosling model. A six string guitar built exactly like the Swan, save for a few necessary adjustments to pickup and bridge placement; and, of course, the new shorter 25.5" neck scale. With the Gosling, Jim wanted to offer the same famous build quality, clarity of tone and focused lows Soloway Guitars is known for with the added comfort and familiarity of a 25.5" scale neck. From the moment I placed my hands around the neck of the first guitar Jim handed to me (a Swan sporting a beautiful quilted burst top) I knew I was going to walk out with one. The fit and finish was flawless, the neck felt great and the tone... oh, the tone! The focus and clarity of these guitars is truly stunning. Even with full-tilt distortion these guitars ring with clarity and articulation and they sustain like no other guitar I've ever experienced. 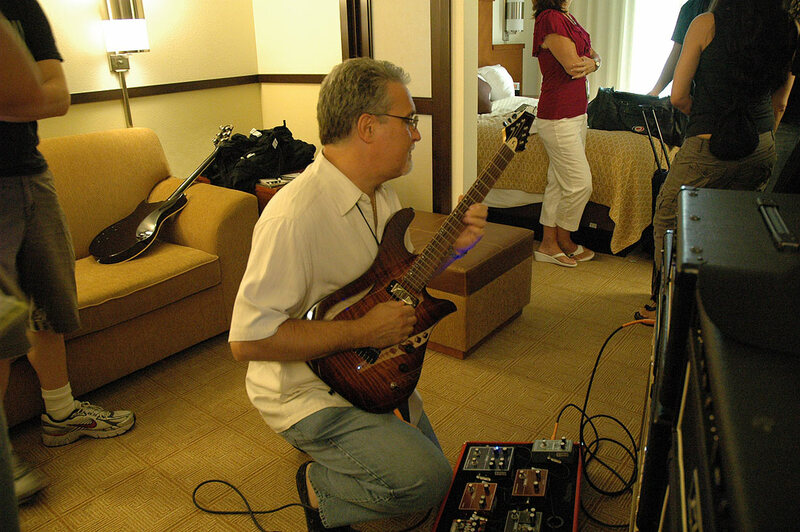 Once I got home with my Soloway, a gorgeous Gosling topped with a flamed redwood burst (-- see above right photo --), I promptly plugged into my rig and let it rip. I was amazed at how much clearer my single note runs sounded and how articulate the notes were in every chord I played, all over the neck. Look for a complete review of this guitar soon. If you have never heard of Soloway Guitars, or if you have and are interested in trying one out you should contact Jim and arrange a demo. Jim keeps a couple of guitars in constant motion going from one test driver to another so you can see for yourself if a Soloway is right for you. I don't think you'll be disappointed! 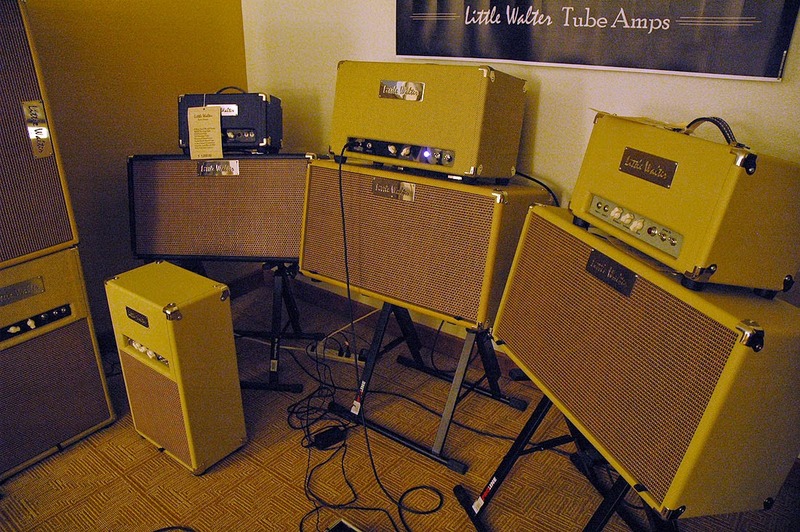 The first thing I noticed when I walked into the Little Walter Tube Amps room was the electrifying ambiance. There was an incredible "positive charge" in the air, an exciting sense of "oh yeah, this is the place to hang out at the Expo". My gut wasn't wrong. I've rarely had so much fun with fellow musicians playing music and talking gear. 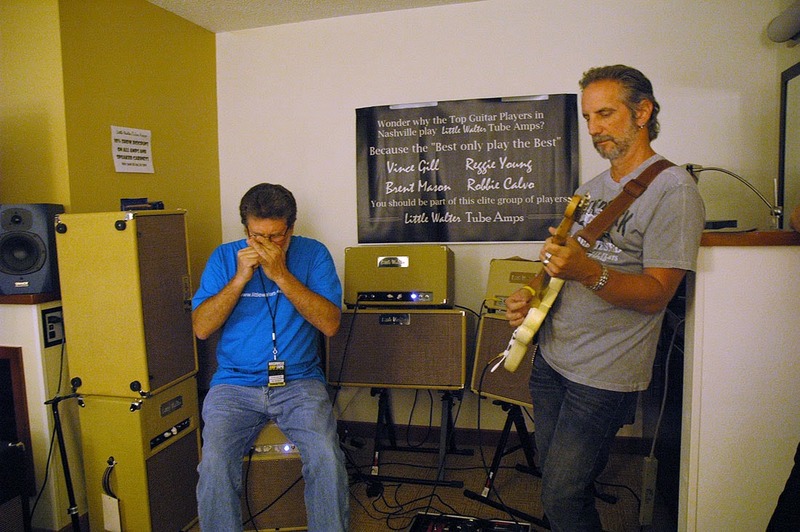 But once you get to know Phil Bradbury, you realize that the Little Walter Tube Amps experience could not possibly be anything short of electrifying and fun. While this guy really knows how to build incredible tube amps, and is a seriously talented musician and technician, he hasn't lost sight of the fact that the real magic is in the heart and fingers. And when you plug into a Little Walter amp there is no doubt that Phil easily pulls off that philosophy in his creations. One thing t hat immediately jumps out at you when gazing upon a Little Walter amp is its inherent simplicity. With only two to three knobs total on most models, there is no need to even open it up to realize that Phil is going for purer tone by minimizing complexity in the circuit and leaving out any and all features that he deems unnecessary to achieve a great sound. Phil's chief motto: "The shorter the signal path the purer the tone" and you need only plug into one to realize how true that statement is. The amp I played through produced a warm, round slightly overdriven tone with beautiful harmonic overtones on top of the notes with t he amplifier cranked up at around 4 or 5 o'clock (which, by the way, was very loud). I love a good touch-sensitive amp and you'd be hard pressed to find an amp that does this better than a Little Walter. Very responsive to the guitar's volume control, as well as pick attack. Another fantastic feature of these amps is the great bottom-end they produce in conjunction with the aforementioned, lovely top-end "sheen" of harmonic overtones. These two things work together to produce a truly gorgeous, full tone that can only be fully appreciated while experiencing the amp in person. Speaking of experiencing the amp in person, I would be remiss if I failed to mention how great these amps feel. 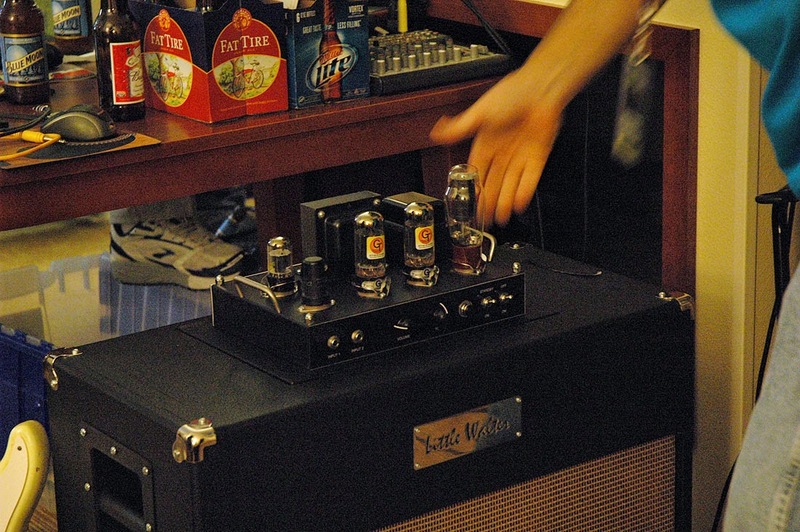 Little Walter amps are tube rectified to provide that classic tube "sag" feel and, overall, have a really nice soft, natural compression that can only be achieved with a well made, well designed all-tube circuit. One other major point about Phil's amp design is the fact that most of his amps use octal preamp tubes (8-pin 6SC7's). According to Phil, these tubes produce a much bigger, more open and full tone with a quicker response. I have to agree! Not only do these amps sound great, they look great as well. With options ranging from tweed covered to natural wood finishes to high-end custom cabinets, the Little Walter looks as fantastic as it sounds. Phil had a variety of cabin et examples in the room (both head and combo versions of his various models) and they were all drool-worthy. Absolute top-notch fit and finish. 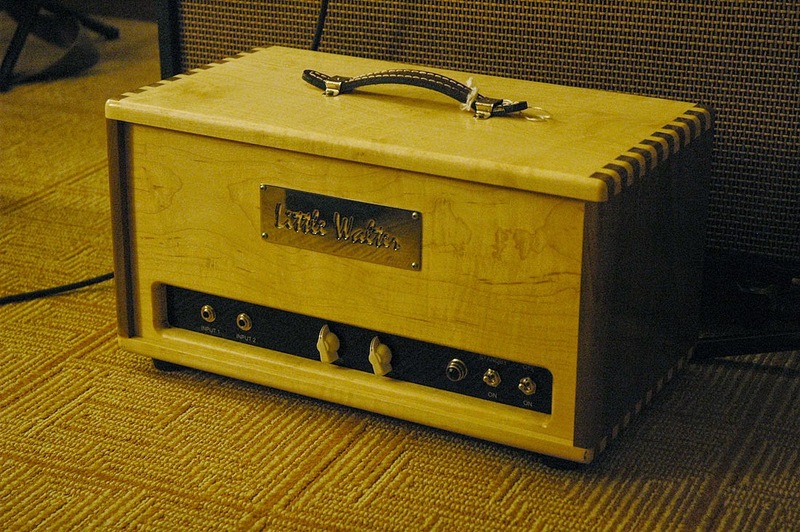 I am sold on Little Walter amps, and as soon as I put the funds together I will be purchasing one. My visit ended with a couple of spontaneous blues jams (one with Phil laying down some awesome harp! --see photo above--). Hanging out with Phil and crew was an unforgettable experience and one I look forward to having again, soon! When I read that TomasZewicZ Guitar Amplification (pronounced “tomas-evich”) was going to be at the Expo this year I was so excited. 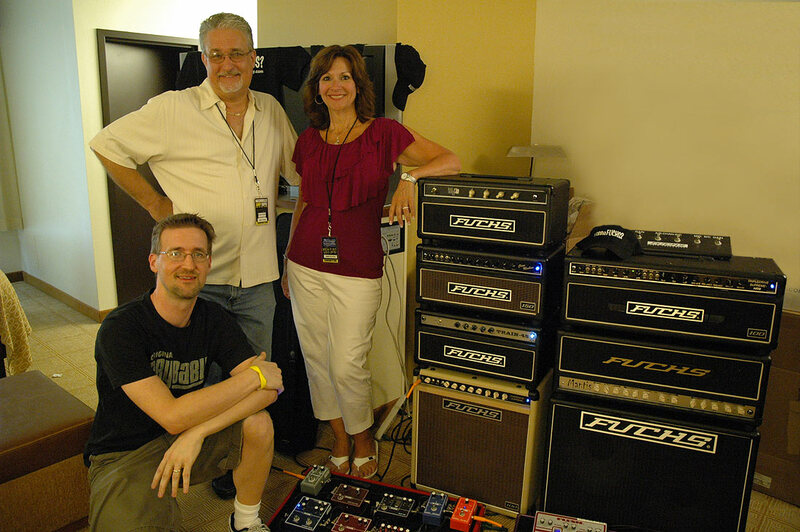 While attending Summer NAMM in 2008 I had the distinct pleasure of plugging into his TZZ-15H combo, which is a super sweet sounding 15 watt EL84 amp. I have never forgotten that tone. It was really great to see John again and to get to plug into one of his creations for a second time. What a great sounding amp! 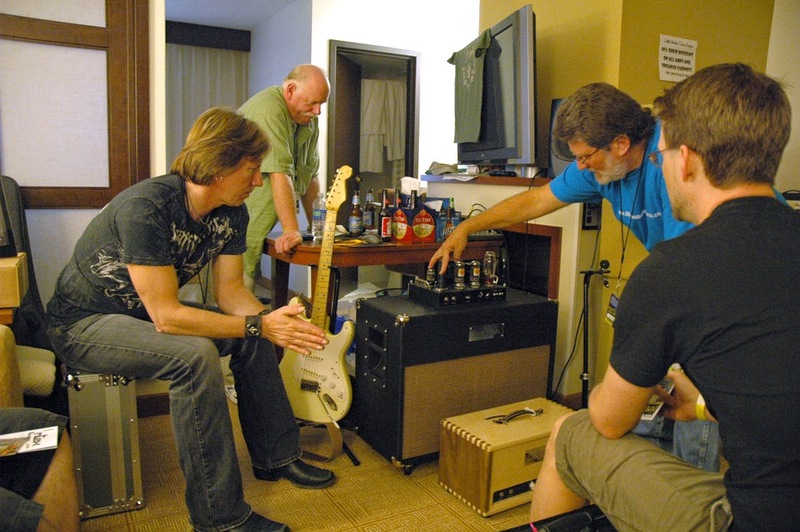 He has created a really special line of guitar amplifiers that really aren't quite like anything else on the market. The first thing I noticed was the Sustain knob located directly above the Drive control. It turns out that John has literally built a studio-quality compression effect directly into the circuitry of the amp. Via an internal trim pot, John pre-adjusts each Sustain control for the perfect amount of compression. This takes out the guess work and provides a simple control to increase sustain and add a bit of drive to your sound. Using the Sustain knob, together with the Drive control, you can tweak the amp to various levels of overdrive -- from crunch to liquidy and singing lead tones. Very cool! The amp also has a tube-powered, buffered effects loop that John claims suffers no treble loss. In addition, all of the TomasZewicZ amp line uses top-notch components in the circuit that far exceed voltage and temp ratings for guitar amplifier application. 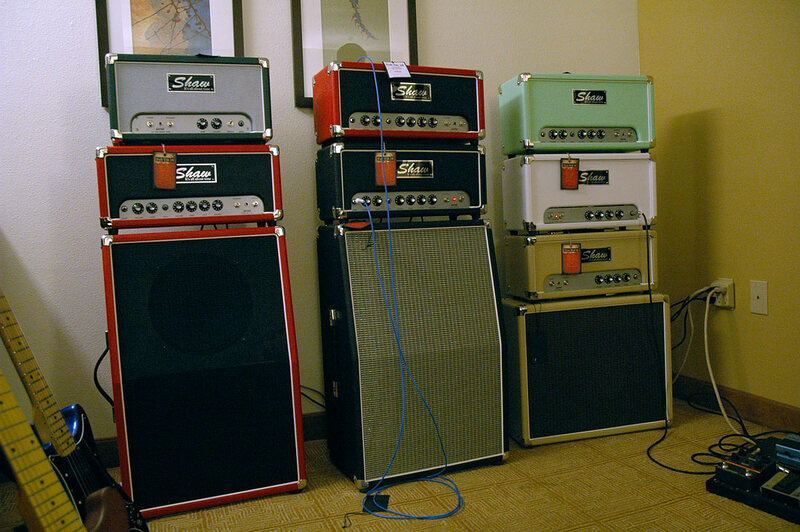 Not only do these amps sound great, they also look like a million bucks. My favorite fit and finish is the blue tolex option. These amps are just stunning in blue, especially the full-size half stacks. According to the TomasZewicZ website, all standard tolex colors are offered and amp covers are included. The cabinets are indestructible 13-ply Baltic Birch with 1/4" finger-joints... and I can say first hand that John's head, combo and speaker cabinets are all finished with flawless perfection. Plugging in to a red TZZ-15H combo I was greeted by that familiar, sweet EL84 chime that I experienced back in '08 at Summe r NAMM. I just love the sustain of these amps. I found that I could play all my lead lines with ease, and the beautiful harmonics on top of the notes make this amp such a pleasure to play. Plus, I could hear everything for a change. John's amps produce such a clear, high-fidelity, articulate tone that you don't really know just how mushy and muddy your current amp is until you plug into a TomasZewicZ. I will definitely be adding one of these to my collection when the funds allow! We had a great time visiting John and his marketing guru, Janet. They were so accommodating! John is one of the nicest guys you'll meet and he loves to talk about his amps. I had lots of questions and he was gracious and patient enough to answer them all. 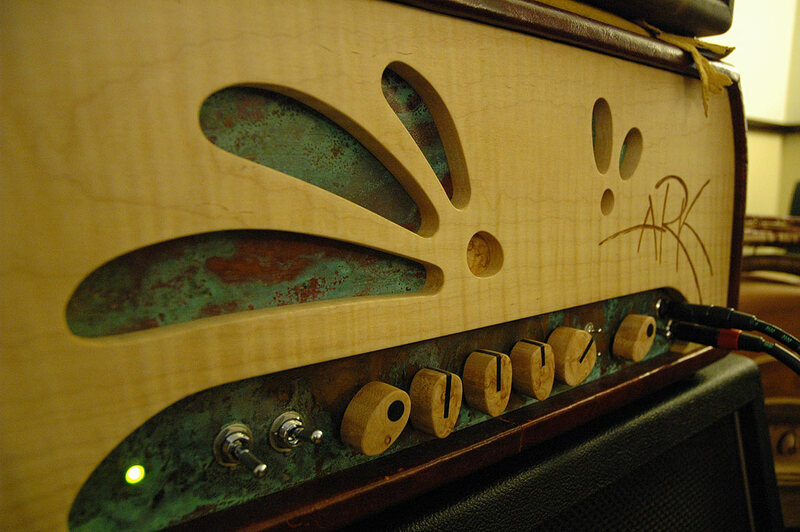 Before you buy another amp, you must check out a TomasZewicZ!